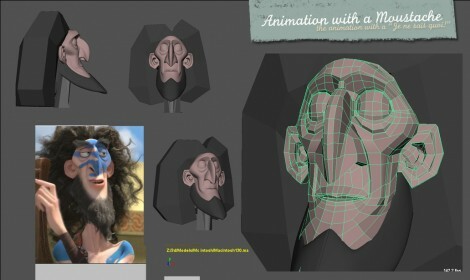 I am also in the Disney/Dreamworks/Pixar… boat so I really wonder if low poly modeling really is a dying art. How long would it take a professional Zbrush modeler to go from a sphere to a final ready for rigging model in Maya/Max? I saw some videos where people would model a Disney character’s face in less than 2 hours but how long does it take to do the retopology? A large scale feature animation production won’t ever have people on staff who would take a character from concept through zbrush sculpt to model and finally to a complete character rig. These would all be treated as separate disciplines by separate departments. So the ability to sculpt or model very quickly would be irrelevant here - things like quality and director feedback would be more important. Retopo would be focused on building a mesh ideal for facial animation. On the other hand a one-man production or a small shop could easily prefer faster turnarounds instead. Here the same person could be responsible for more than one stages of the production and design aspects, perhaps even all of them (although that is still quite rare and will probably get more and more rare as technology gets even more complex). It’s quite a short time…I did recently a head in an hour or so, but it was not for articulation. In my opinion (to me) having the two stages separated is more productive. While sculpting, I see the forms, and work on the forms only. A lot quicker (to me). Then, when everyone’s happy, I can do the technical stuff, and retopology the character. A complex mesh used to take about a day or two for games (10-15k). Agreed. Though i believe every good modeler should be able to sculpt and retopologize. Regarding the mesh, if you subdivide it every ngon becomes 4 sided. Or are you talking about poles? I’ve been trying out for high rez bases subdividing a semi-dense mesh and then editing that. Removing geometry when there too many edges and adding more when needed. Yes I mean poles by n-sided vertices. And yes, building a lowres mesh, subdividing, and then cleaning up is a perfectly valid workflow. So true! I remember obsessing over Bay Raitt. He was truly ahead of his time. @Ciroman, regarding which method to use I would have to agree with Laa-yosh about organic box-modeling being somewhat obselete. Maybe I’m bias, but I’ve always found box-modeling a head to be a real painful task as opposed to poly-by-poly modeling. and now even more so with the advent of Sculpt/retopo. Now don’t get me wrong, there are people like Glen Southern who thrive on box-modeling and can read the forms/flow with ease. I’ve always found it to be artistically counter-intuitive however. Sculpting/Retopo allows me to create without worrying about topology and it’s so much quicker to experiment with forms(even drastically) with worrying about re-directing/re-distributing edgeflow. And retopo can be created so rapidly with the aid of a topo-sketch paint-over in your sculpting app so the flow can be worked out non-destructively without ever having to cut/redirect whilst in the process. once you have sketched the topology in 3d on the mesh it’s a simple case of tracing at the retopo stage. So I suppose it certainly is a case of personal preference(everyone’s brain working differently:) but I do feel that box-modeling heads is indeed a dying artform. So it seems like it’s soon time to upgrade my pc if i’m going to go for this dense mesh pipeline. I currently have around 5 years old pc with some upgraded components. q6600, 285gtx 2g and 8gig mem. So is this blendshape method the only practical way to go these days for realistic face deformations? I was planning on building some wrinkle normal map blending system for the rig earlier before i read the last coulple pages of this thread. Here’s some not so typical human face you see everyday on a street. What do you think of the face topology? Rest of the body is still old lowpoly so its 20k triangles so far. I have no idea how much polygons they use these days for films or games. I’m kind of unsure how much should i follow the human face topology, considering she behaves like human and is able to do human like expressions. I almost never used box modeling for organics. before i began using zbrush or mudbox i used the sculpting tools in maya to get basic sphere into a head, then made it live and started slapping polygons over it. I still find it pretty fast way of getting basic shapes done. 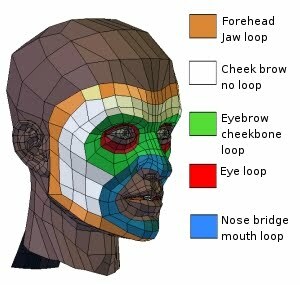 Topology doesn’t seem to be aligned to facial features so realistic deformations could prove to be problematic. But if you’re going for a more stylized look, like How to train your Dragon, then it’s OK mostly - maybe the upper eyebrow could use some more loops. I’d also make the loops around the mouth follow a concentric ripple layout to better accommodate extreme movements like smiling or an “ooh” shape. I got impressed by the Claytons face animation videos you linked earlier. I think he used blendshapes in that rig. I’m going for more realistic animation with this one. So, i’ll try to work more to make the edge flow follow the facial features. I’m not sure exactly what you meant by the “concentric ripple layout”. This one is more experimental personal project for practice so i don’t have a deadline nor clear direction where to go. I built a ribbon based mouth rig for other school project earlier. It has worked pretty well so far. I might try it with this one and compare with the blendshape method when i get some good topology done. I went back to zbrush and painted some lines to figure how to get the edge flow follow the facial features bit better. I had to make a lot of weird faces in front a mirror to see where the wrinkles and stuff actually forms and then imagined if this character tried to make the same expressions how would her face deform and where the wrinkles would appear. I ran into some problems… The blue lines are where i thought some wrinkles would aproximetely form in certain expressions. So i tried to make the edge flow to align with them. The blue line that starts from above the nose then goes around the mouth below the jaw is pretty important i think and it was missing from the previous face. This is where i ran into problem. What i’ve experienced is that those 3 sided vertices are the most harmfull for deformation. in wrong places they cause evil bumps. I’m trying to avoid them where the red line is pointing. Here’s the messy drawing i did. here's some progress.. probably a bit better but im not really sure. Here's a rough blendshape test. I sculpted it in zbrush. I didn't use much time on it so it looks a bit awkward here and there. What's the hairless cat called? Sphynx ir something. That could work as a reference. (edit) The video wasn’t great so here’s a pic of the blendshape it self. its slightly improved from the one in the video. Maybe i should make a separate thread about this cos i'll be working on this for a while so i could keep updating it once in awhile without flooding this thread. hey HD, any chance for an Android version. I would love to read your book. I would love to do a Android version and plan to do so as soon as Google can support embedded videos, since this iBook has 135 videos in it. what would be a good way to connect the parts? Be those arms to torso or eye sockets and face, I always struggle to find a solution to dissipate the edges. Is there any strategy I can employ? Tried making big volumes and adding details when the main loops are in place - I end up with lots of extra loops going in circles, or edges piling up in areas. Hey guys, I was wondering why the topology of Richard Parkers model is so much different from the topology of the wolf in Red Riding Hood. Both animals have very similar bone and muscle structure and both were modeled by Bradley Sick at Rhythm & Hues. I assume, that Rhythm & Hues used similar workflows (skeleton, muscle, skin, fur) for those animals, but why is Richard Parkers topology following the muscle structure and the other isn´t? I´m planing on animating a quadruped and therefore I need a good and clean topology. Has anyone an idea, which approach is the best and why?